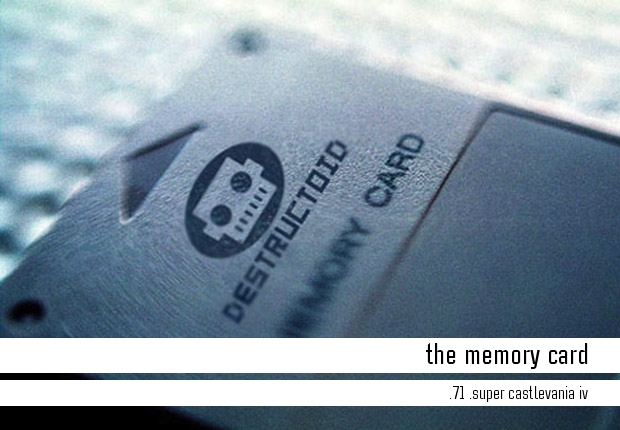 Last week was the first edition of a three-part Memory Card miniseries specifically focusing on amazing moments in videogame graphics over the years (I am calling it The Graphics Card). Last week’s entry featured my first “holy sh*t!” graphics memory from the Nintendo Entertainment System. This week, it’s time to move on to the 16-bit era -- more specifically, the Super Nintendo. The Super NES is my favorite videogame console of all time, and it is home to more beautiful visual moments than I can even list. 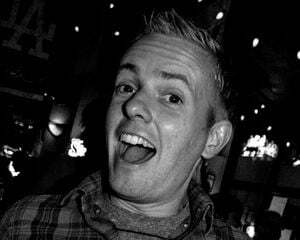 But, just like last week, this is an article on my first memory of being impressed by the graphics on a particular console, not the end-all-be-all, best graphics ever to grace the system. Thinking in these terms, one moment quickly came to mind. The moment is in Super Castlevania IV and is one of only a handful of videogame moments that remind me of a specific, wonderful time in my childhood. Keep reading to find out the strange reason why. Hit the jump for Part 2 of The Graphics Card trilogy (of amazingness!). 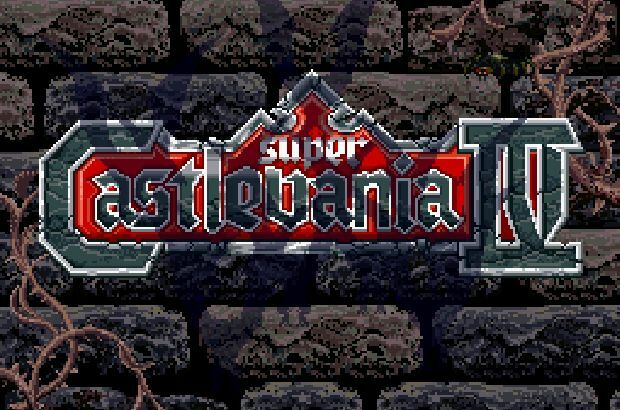 One of the most anticipated videogames at the very beginning of the Super Nintendo’s life cycle was Super Castlevania IV, a reimagining of sorts of the original Castlevania for the NES. 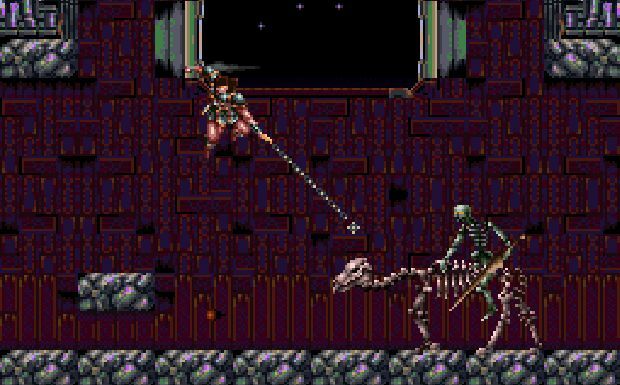 Once screenshots were shown of the brand new side-scrolling Castlevania sequel, gamers flipped out over the fancy new 16-bit details on display. Frustrating mermen flying out of the water had never looked so glorious! 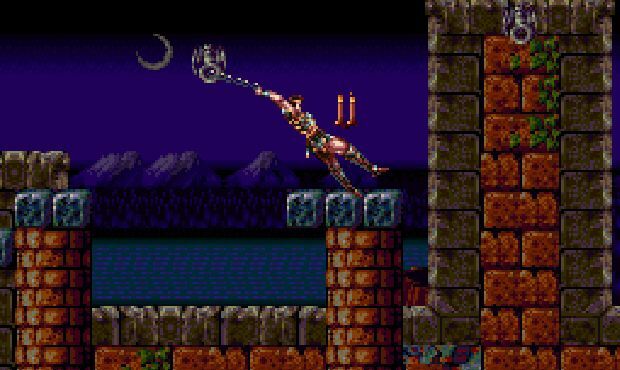 In the game, you play as whip-wielding Simon Belmont as he, once again, journeys to Dracula’s massive castle to destroy the pure evil king of the vampires. The story is basic and very similar to the original -- hence the reason Super Castlevania IV is looked at by many as a reimagining of the first game in the series. After changing up the gameplay in Castlevania II and III with a more open world structure and multiple playable characters, respectively, Super Castlevania IV returns to the series’ roots, offering players a completely linear, level-by-level structure. Basically, Simon travels through a (beautiful) level, fighting enemies and navigating the environmental hazards, until finally fighting an epic boss at the end of each stage. 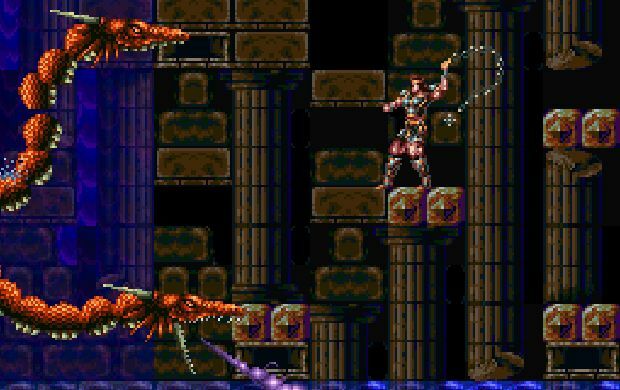 In addition to the obvious graphical improvements, Super Castlevania IV offers one particular upgrade that adds a whole new level to the already outstanding gameplay. Instead of just being able to swing his whip straight ahead, Simon can actually snap his famous weapon at eight different angles, equal to all the directions on the SNES control pad. While this serves very useful in defeating enemies, Simon’s new whip skills take a twist about halfway through the first level. Scattered at specific spots in the game are little metal rings. When Simon hits one of these rings with his whip, the leather weapon coils around it and allows him to swing back and forth, Indiana Jones-style. The first time I got to do this is almost a Memory Card moment unto itself, but things only get cooler later in the game. One of these “cool” moments occurs later in the game and is the focus of this week’s edition. Enter the rotating room! After playing through a few levels, Simon enters a tall tower right on the outskirts of Dracula’s castle. Once he defeats a huge skull mini-boss in the first part of the level, Simon enters a section of the tower that is full of many traps. Although there are many “platforming” sections in previous stages, this section of the game is a constant barrage of moving walls and tricky jumps. While most of the game up to this point focused on battling monstrous enemies, the tower level features a ton of environmental challenges, each one more creative than the last. After walking down a dark passageway covered in red stone, Simon climbs a set of stairs and enters a strange room. On one side of the room is a giant wall of spikes, while the other side of the room is nothing but a dead end. At first glance, the only way out of the closed-off room is through an open passage in the ceiling -- a ceiling that is way too high to jump to. Before he has a chance to figure out a plan, the passage Simon entered in closes behind him, sealing him inside. Suddenly, the room starts to shake. In a shocking surprise, the entire room starts to rotate counter-clockwise. As the floor Simon is standing on gets higher on one side, he starts to slide closer and closer to the deadly spikes that line the left wall -- a wall that is slowly starting to become the floor! Eek! Lucky for Simon (and the player! ), a familiar metal ring sits waiting in the middle of the room. Without even thinking twice, Simon whips the ring and immediately hangs from his trusty leather companion. As Simon hangs safe in the middle of the room, the entire room rotates around him. After what feels like hours, the room finally stops spinning. What was a vertical column becomes a safe, horizontal platform for Simon to drop down on. Once he safely lands on the platform, Simon is able to move forward and enter the passage that was once the impossible-to-reach hole in the ceiling -- all the while avoiding those damned flying Medusa heads. With his whip in hand, Simon continues onward to put a stop to Dracula. When I was really young, my brother and I used to create the most ridiculous adventures in the basement of my house. One day we would jump from box to box, toy shelf to couch, as we tried to reach the other end of the basement without touching the “lava-covered” ground. What can I say? We had overactive imaginations. This story has a point, though. When I first reached the rotating room in Super Castlevania IV it reminded me so much of the adventure games my brother and I used to play in the basement of my old house. For the first time in a videogame I was recreating these exciting action sequences that I always wanted to be a part of. It was a glorious discovery. Even to this day the sequence brings back intense nostalgic feelings. But looking past its odd connection to my (embarrassing) childhood stories, visually, the rotating room sequence was absolutely mind-blowing for the time. It goes without saying it could never have been done on the NES. When the Super Nintendo came out, a lot of early games showed off some of the brand new graphical features that could only be done on that console. 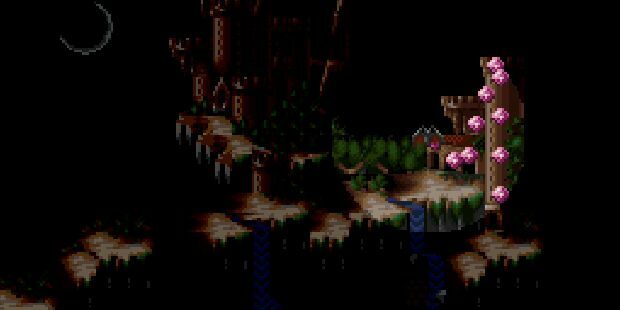 In Super Mario World, giant, green, transparent blobs floated around the Ghost Houses; in ActRaiser, the camera would zoom from the sky into the ground below, all the while spinning around as the map got larger and larger on the screen. These effects were (and still are) cool and completely impressed me the first time I saw them. But the graphical effects in these early games were more about looking fancy -- not very often did they apply directly to gameplay. 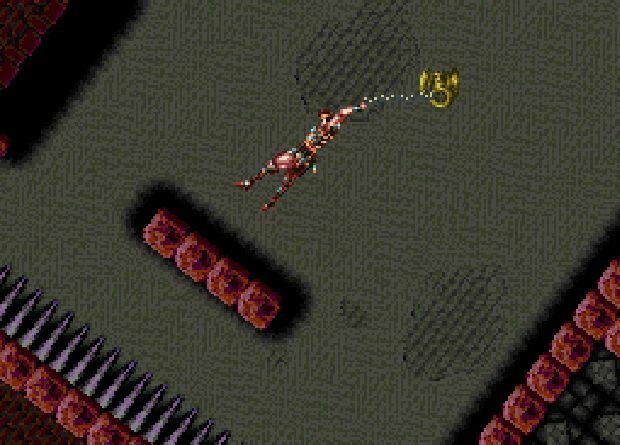 With the rotating room in Super Castlevania IV, however, all the visual fireworks that happen on-screen completely relate to the control of the main character. 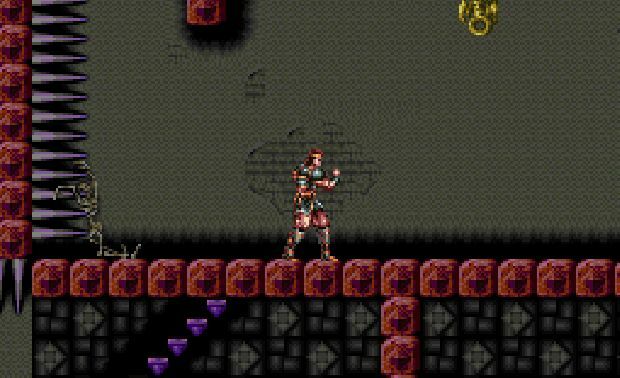 Simon Belmont is standing in a room that is rotating. Think about how unheard of that was before the SNES was born. Just watch it in the above video again. The visuals are incredible! If the player doesn’t react quickly enough, Simon falls to his death in the spikes below. The entire sequence is exhilarating and totally possible because of the graphical power of the Super Nintendo. Now, I am not claiming that this moment is life-changing and emotionally moving like the Opera House in Final Fantasy VI or the return of the Baby Metroid in Super Metroid. Quite the opposite in fact. The graphics in those scenes, as a whole, are much better and utilize a plethora of visual techniques to elicit strong emotions in the player. What the rotating room represents is a significant step forward in the visceral power of videogames. The first time I experienced it, when the room started rotating, I was Simon Belmont. I felt his fear and panic as he, and in turn I, struggled with what to do. The sequence may have looked cool (my God, the room is actually spinning! ), but at the same time it is completely stressful. Exciting and awesome, but stressful. In a way, the rotating room was the first thing that opened my eyes to the wonder of 16-bit graphics ... on a system that would go on to be my favorite console of all time. That makes it a pretty special moment, indeed.